All red pepper jelly fans, put up your sticky, jelly covered hands! There are some projects around the home that are just so stinkin’ satisfying. Okay, maybe not in the thick of it, but when you stand back and look at what is accomplished. I’m not thinking things like laundry. To me that will never be satisfying… but organizing and labeling a messy closet, or preserving a handy little gift for later… now we speak my language. I’m by no means a pro behind a canner, but red pepper jelly is something that’s pretty simple to DIY. Not into that? We also LOVE Epicure’s Red Pepper Jelly! – yup, you can purchase this pretty and delicious concoction, and you can have it shipped right to your door. Exciting times ahead. I would go that route; purchasing and shipping boxes to my door… but, the thing about Red Pepper Jelly is that the more you have, the more you use. The more you use it the more you want it -this may sound a bit like I’m describing the cycle of addiction. ‘nuf said. 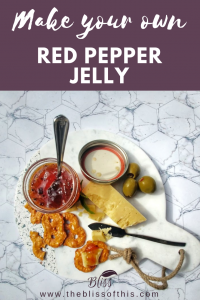 How do we use our Red Pepper Jelly? 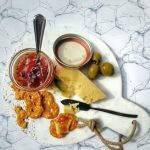 The obvious Brie and Red Pepper Jelly: Bake brie cheese in the oven, and served with crackers and red pepper jelly. Flavored Cream Cheese and Red Pepper Jelly. Don’t worry- it’s deceptively easy… warm cream cheese with Herb & Garlic Dip mix stirred in, and Red Pepper Jelly on top. Easy peasy. Add a dollop to stir fry. Save a few extras for the beggers who plead for a jar after they’ve tried your fancy fare. They will love you. You might just want to make more than a double recipe 😉 Between a friend, my sister, and I, we’ve made over a hundred jars of this beautiful spread. I’m no homesteader, but this is something that always seems to work out. There’s a few ways this jelly can be preserved. I’ve chatted with a lot of experienced Jelly and Jam makers who have preserved for years using hot jars and lids. Though there are some who will greatly shame me for sharing this method; it’s worked for us and many others for years. A more cautious method is provided as well.. I prefer to make my jelly in these jars– it’s the perfect size to take along for appetizers or charcuterie boards. You can go ahead and use a larger size- the method is the same; but we have found it isn’t necessary. A simple set of canning tools is a must have for us too! We the handy gadget on the far right does not get enough appreciation. This lid wand is as magical as it sounds: it is a magnetized stick that lifts your hot lids right out of the water. No more messing around with a fork or hot fingers! Canners experienced and new love it! Make your own red pepper jelly at home with this easy recipe. Great for stocking stuffers and teacher's gifts! This recipe calls for Arrabbiata Pepper Blend, but can be substituted with dried chili pepper flakes if needed. Prepare jars and lids: sterilize, and warm seals in hot (not boiling) water. Remove stems and cores from peppers. Roughly chop- they are going in the blender, so don't worry about keeping it fancy. Blend in high powered blender. Drain pepper mixture over cheesecloth. Do NOT squeeze the cheesecloth, as this will result in a cloudy jelly. I usually wrap the cheesecloth with an elastic and hang it on a cupboard knob to drip out. Seal while still hot. Process in hot water bath for 5 minutes or until sealed. Sterilize jars in the dishwasher or in the oven at 150F for 15 minutes. Keep an eye on the time- you want them to be finished as soon as your jelly mixture is ready to be poured so it stays good and hot. Remove jars one at a time, and pour hot jelly mix into the jar. Add warmed lid and screw on the seal. Set on towel for 24-48 hours. You will know they are sealed when the little "bubble" in the lid pops down. A beautiful, beautiful sound. I'm expecting some sort of harassment for even sharing such a method. It's not the "industry standard", but it has worked for us for years. Try at your own risk. Prepare your water bath. This can be done with a fancy canning pan, or even just a pan with a metal rack in the bottom. There should be enough water to cover the jars, but not so much that when the jars are added it will boil over. Ahhh physics. Sterilize jars. Once liquid is prepared, pour into sterilized jars. Seal with lid, and screw on ring. Pop into the water bath for 5 minutes. At the end of the 5 minutes your jar should be sealed. Set on towel for 24-48 hours.